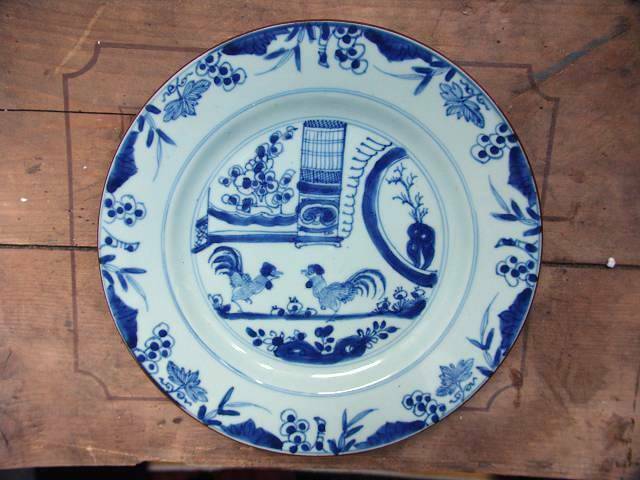 The most characteristic porcelain item from the Gotheborg Cargo are the Rooster Plates. This specific plate was given to Berit Wästfelt by David Keiller, heir of the estate of James Keiller d.y. The only systematic analysis ever made of the cargo of the East Indiaman Gotheborg was made by Berit Wästfelt after the excavation of the Gotheborg organized by her and her husband Anders Wästfelt. The main result was published in Berit Wästfelt et al. in The porcelain from the East Indiaman Götheborg, 1990. In this book she presents the main excavation results and the blue and white part of the cargo based on the reconstruction drawings made during the excavation. Bo Gyllensvärd contributes a closer presentation of the decoration. Later accounts have been published elsewhere as in The Golden Age of China Trade 1992, Bengt Johansson (Ed.) and Ostindiefararen Götheborg 1994, Jan-Erik Nilsson (Ed). Totally between 1986-91 it was taken up not less than 6 tons of porcelain shards. All in all 300 complete items were found on the excavation area. 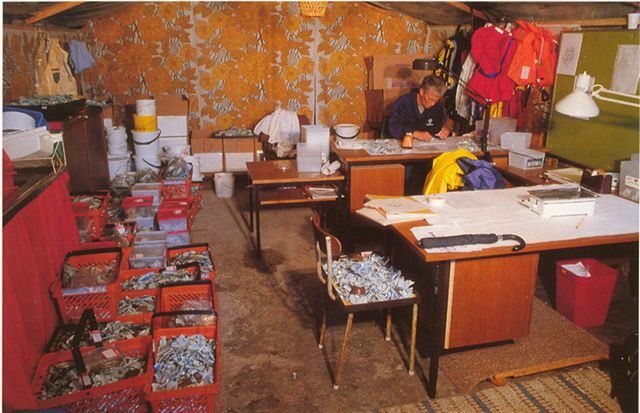 The complete items were much too few to represent more than a small part of the cargo and the analyse of the cargo that could be done was thus needed to be done based on the shard finds. It could be argued that even the shards actually represents a skewed selection of the total cargo, if we assume that the cargo was in fact salvaged immediately after the accident and the shards comes mostly from what was dumped and left as broken already them. In fact there are solid written evidence as in the report from the Diving Company Director Bagge, who in 1746 reported that 'the further salvaging was now given up because the remaining cargo was under an impenetrateable cover of soggy tea leaf that was impossible to get through'. The diving technology of this times was also such that not much work could actually be done under water beside simple operations as in locating cannons and fastening ropes to larger objects to be lifted from the surface. In fact actual salvaging at this time must be admired as true heroism made at great personal risks. At the time of the next salvaging period the diving technology had improved giving possibility to more vision and flexibility but, which is important to us, at this time the fashion for oriental porcelain was at a low ebb and the main interest were in the blackened oak in the ship's hull. No doubt some porcelains was found as labeled finds still in the antiques market bear witness of, but if we goes strictly on what we actually know, there were so far no trace in the documents of the maybe half a million porcelain pieces that should still be down there possibly still 'under an impenetrateable cover of soggy tea leaves'. What could have happen given there are 260 years from the foundering of the ship until now is that the majority of the porcelain cargo was in fact left where it were since it was covered by 300 tons of (dry weight!) tea leaves. As the wreck breaks or are broken apart the tea leaves and what it covers are spread over a large area mainly downstream of the ship. It is a very important point to remember that the Wästfelt excavation was made on sample trenches only, and was by the last seasons directed mostly towards uncovering construction details of the ships hull rather then finding the remaining porcelain cargo. It might maybe at this time be necessary to remind about that this excavation was carried through based on voluntary work and private interest only. The wreck site had since long been given up as of no interest. If someone today thinks that there is an enormous value in remembering the East India trade to the city of Gothenburg, that is thanks to this project and the following Ships Reconstruction project - all started by voluntary work and private interest only - and not the other way around. At this time there were no public funding available whatsoever for this project. It is also worth mentioning that after that the harbor authorities had dynamited the reef and dredged the area to its double depth in 2003 Chinese porcelain shards could still be found on the bare rock surfaces found by divers who inspected the area under water. To some extent the shard finds confirms that the total cargo was to a large extent left as it were since all kinds of pieces up and including expensive special decorations - that by no means could have been thrown in first while loading wrapped in straw bundles - were found. To some extent the mixture of finds as in shapes and decorations is also a part of the mystery that now forever will cloak this ship. From the cargo list of the ship they knew the Gotheborg had carried 289 chests, 12 tubs and 238 bundles of porcelain, weighing all in all around 100 tons, this all in all probably being between 500,000 - 600,000 pieces. Any description of the actual content of these chests and bundles has not been found so far. At the actual wreck site inch by inch was excavated by hand. All smaller items was brought up to the surface by a salvaging pump and sorted by a staff already at the diving platform. The finds were catalogued by index number as to where they were found. Larger items were picked up by hand or left were they were. All finds were registered with its coordinates within the excavation grid and drawn onto the site map. From the sea, tons of porcelain shards were picked up. All the findings were brought to the base camp at the Fortress of New Elvsborg for registration and preservation as the case might be. based on 7 tons of shards at the excavation base camp of the New Elfsborg Fortress. To study the porcelain cargo, the sorting was made in 3 steps, where the first was to separate the shards according to decoration. The most common type of decoration on the porcelain of this cargo was maybe as expected underglaze blue. To produce this kind of porcelain it took only one firing, which made it comparably inexpensive to produce however among the shards of the cargo of the East Indiaman Gotheborg, slightly more than half of the porcelain seems to be of this type. Since the decoration has been protected by the glaze, it has survived the long time in salt water without any mentionable damages. 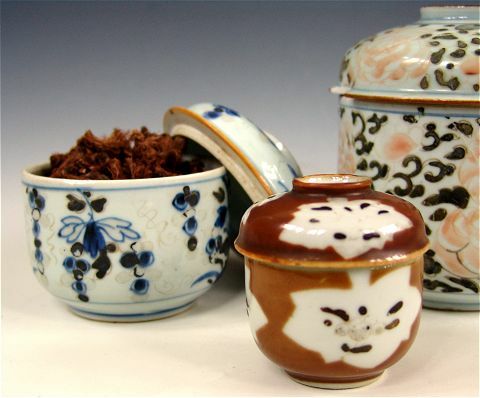 The second largest part of the cargo as represented by the excavated shards was porcelain with underglaze blue decoration combined with an all covering brown iron based glaze on the other side. This type of wares are usually called 'Café au lait' or 'Batavia' and in this sample proved to be less sturdy than the sole 'blue and white' part, and had to a large extent lost its gloss. When the 'Batavia' brown glaze surface eroded over time, it seems to have made a good ground for barnacles and clams to live on and a large number of brown glazed shards was found with encrustation particularly covering the brown glazed surfaces. One special variation of polychrome decoration called 'Chinese Imari' was found on around 10% of the shards from the excavation. The Chinese Imari decoration were defined in Berit Wästfelts report as porcelain with a combination of underglaze blue cobalt and on-glaze enamels of which mostly appeared to be iron red and gold. Quite a number of shards with their enamels intact was found to merit this classification and to establish the normally occurring decorations. Traces of the iron red colors could often be seen in outlines and in rare occasion, traces of gold. Naturally the enamels were corroded and degraded by salt water and sand that had twirled around the shards in the streaming water around the wreck site. Most of the enamels were, due to these processes, lost. From the excavation report it is thus not possible to see if some of these shards classified as Imari could in fact have been 'famille verte' or wucai type decoration with underglaze blue combined with transparent enamels, but for the sake of analyze any such occurrences seems to have been negligible or none, but if occurring by necessity combined with 'Imari'. Besides these three types of decorations, that were most common, several different variations of the enamel decorations on the in or outside or in reserves / panels were found. Common to these decorations were that they have lost most of their colors and were difficult to figure out or see. The remains of the decorations were mostly seen as in gray contours and black often metallic looking, pulverized remains of enamels. To find out what these decorations actually had been, some attempts were made by Berit Wästfelt to fire again some of the shards to find out the original colors. This was reasonable successful, showing the normal type of famille rose colors. Since the overwhelmingly large majority of the cargo was tea quite a lot of tea had covering large areas of the excavation area with thick layers of soggy tealeaves. Inside these layers, shards of enamel decorated porcelain pieces could be found with completely preserved and intact colored enamels which further strengthened the analyze and classifications groupings. These shards were also used as reference to the re-fired shards which turned out pretty much the same as the originals. Besides the above decoration types, small amounts of a more rare decoration such as 'powder blue', sometimes with added decoration in gilt gold and, Laque burgauté, which is porcelain covered with Mother of Pearl and gold set in lacquer. Also a limited number of totally white undecorated pieces of porcelain seems to have been brought in. One type that occurred in small amounts was the variation often called 'soft paste'. Shards classified as this was distinguished by being thinner, whiter in shade and having extremely well painted decoration often under a crackled blue and white glaze. A special group was small figurines as small dogs, incense burner stands and water droppers, and small seated Chinese boys. After this first sorting, Berit Wästfelt attempted to figure out which shapes of porcelain that was found within the different groups. It is important to note that in spite of considerable efforts very little could be said about the cargo as a whole. In most cases the shards were too small and too few to give any conclusive results. Some shards were up to 1-2 cm in thickness but of a size of only 2-3 cm which must have come from a very large object. In short Wästfelt could conclude that the majority of types from the available sample were mostly cups and cups for tea, coffee and hot chocolate. Cups and sauces for tea, coffee and chocolate. Plates. Dessert or fruit dishes of medium sized and bowls of a medium size. Most of these items were well suited to be packed in bundles that fit well with the cargo list of 2,388 bundles. One of the most characteristic shapes of this cargo was lidded jars of uncertain purpose. They were transported in nests of up to five where the smaller were stored inside the larger. From fired enamels found on the inside walls of these jars it shows that the enameled decoration was fired with the pieces stacked inside each other giving great economy in production. The most common or at least typical are the Batavia brown with leaf shaped reserves. Photo: Jan-Erik Nilsson, 2005..
To a lesser extent parts of tea sets or dinner dining sets with specially ordered decoration was also found. Surprisingly, no dinner set parts except two large dishes were found among the blue and white porcelain. A speculation that could be made from the Wästfelt excavation and report, would be that a larger then proportionate part of the found shards could come from the porcelain that were packed in bundles rather than chests. Due to the forces when hitting the rocks most probably all porcelain on board could have been broken and abandoned at the wreck which can explain the occurrences of many rare decorations that by no means should have been packed in bundles. Considering the reputation this ships wreck have had over the years, it could also be that some of the porcelain cargo was stored in irregular spaces, not intended to be found by the companies inspection on arrival. It needs to be reminded that this is speculations only but, repeated through history as common knowledge regarding this wreck. For Berit Wästfelt the next challenge was to separate the different motifs of the porcelain shards and to try to reconstruct the shape and decorations on the whole items by drawing. Due to the many attempts to salvage the cargo during the centuries most of the finds were in very small shards. Luckily, thanks to the large number of shards, it was still possible to reconstruct the motifs a work that took several years and is presented in her book. In short more than 100 motifs were possible to reconstruct of the blue and white porcelain. Some of the motifs took more than 4 years to find enough shards to make a complete motif. One task that is left to future archaeologists is to look into the colored part of the cargo. The enameled decoration has almost totally disappeared but can still be studied by the dull etchings left in the glaze. Among these shards were, besides a large number of beautiful Chinese style flower motifs, at least 7 different motifs with a specifically ordered western style decoration can be found. Of these, at least two with Coat of Arms of which one was Swedish and the other Dutch. As a curio Berit Wästfelt finally mention that it only in one occasion was possible to put together one complete item from shards found. During the summer of 1990, the shards of one underglaze blue and white bowl with a dragon was found. Before this excavation season was over, the bowl had become almost complete and during one of the last days of the excavation, the last single small piece was found. The dragon surrounded by scrolling clouds went from the inside of the bowl and over the edge to the outside, holding a flaming pearl between its claws. When the exhibition of the finds from the Gotheborg was opened at the Flagstaff House Museum of Tea ware in Hong Kong in March 1991, this complete dragon bowl had got a place of honor of itself. Two armorial services were found in the cargo, 3 sets of porcelain with monograms or initials, 1 tea set with a portrait, 1 tea set with a motif copied from Meissen porcelain showing two men sawing timber and a punch bowl with a copy of a medal. This text is based on Berit Wästfelts et. al. report 'Porcelain from the East Indiaman Götheborg, 1990, combined with own research and observations.